What can I say, yesterday the stars were aligned. My sister and I had arranged to meet in the city for a fun museum day and birthday lunch (hers – I no longer have birthdays). We planned to see the Van Cleef “Set in Style” exhibit at the Cooper Hewitt followed by the Vienna exhibit at the Neue Galerie where we were going to also have lunch. But things didn’t go exactly as planned – they actually exceeded expectations! I hadn’t been to the Cooper Hewitt for quite a while – too long. So while I awaited my sister’s arrival, I decided to check out the gift shop, which turned out to be a dangerous proposition. Even under normal circumstances, it is a treasure trove of temptation. But the oh so creative and clever Gregory Drum, head of retail for the museum, added a special section to coordinate with the show. 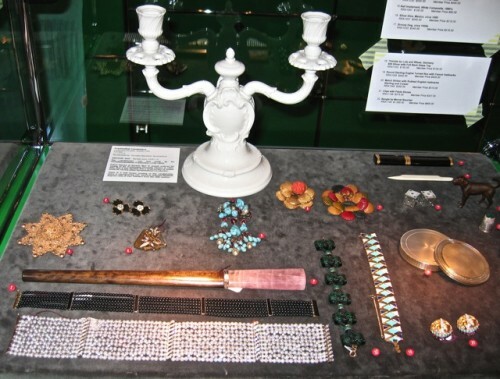 Several of the cases feature vintage treasures that were procured especially for this occasion. This photo certainly does not do justice to the many beautiful jewels in this case. In the back you can see a lovely Edwardian round pendant of sterling and paste as well as a festive glitter ball necklace. In the lower right is a quite spectacular gripoix Chanel (or perhaps Dior) Maltese cross brooch marked France 1955. The beautiful Panetta brooch in the lower left with natural amethyst crystal, gilded leaves and paste no longer resides there – now in the possession of a lucky birthday girl. You know I had to try everything on. This Edwardian pearl choker in front almost seduced me – it is simply divine – delicate yet a major statement and a perfect fit – evidently unusual as the very accommodating sales manager explained. In the back is an absolutely beautiful Frankenthal candelabra, made at Nymphenburg from the same original mold as the 1762 original – the luster was just lovely. There were also some intriguing pieces by contemporary designers, including beaded pieces designed by the Rodarte girls and made by their mother. After several irresistible book purchases from their impressive collection, it was time to move on to the actual exhibit. Words cannot quite express the brilliance of this show – on so many levels. 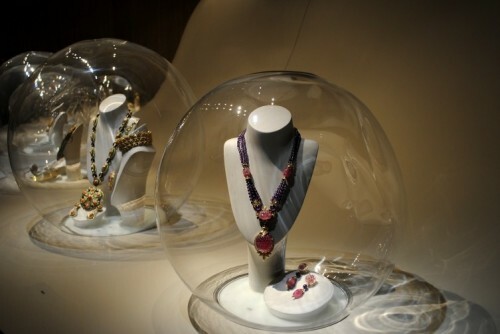 Not only is the jewelry itself magnificent but the organization of the exhibit, the ingenious design of the exhibition space and the innovative integration of technology create an incredible feast for the mind and the eye. You may not realize, but this is quite a large exhibit – 350 pieces of incredible jewelry are on display, making it the most comprehensive exhibition every organized to display the works of this venerable company. As you enter the museum, you are asked if you would like an iPad with headphones, courtesy of Apple, who donated them for the show. If you own an iPad, I highly recommend the free download for the exhibit available from the iTunes store – it is a fabulous introduction you can watch at home. The design for the exhibit was executed by Patrick Jouin of the French firm Jouin Manku. It is one of the most innovative and beautiful installations I have ever seen. Jouin wanted to not only enhance the jewelry but evoke the past of the historic building. 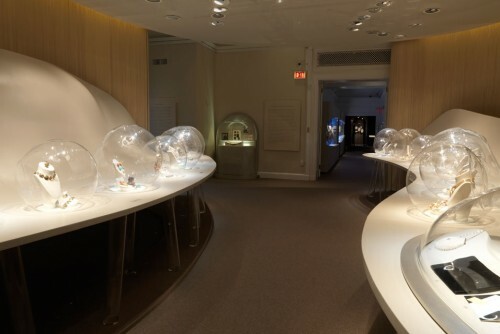 “I thought it was interesting to reconnect the design of the exhibition with the history of the building, because Van Cleef & Arpels also has a long history.” Here is a terrific interview with Jouin explaining his concept for the display. Many of the glass encasements echo the arches of the building and fit into the decorative aspects of the millwork. And the flow of the undulating curves echo both the designs of the jewelry and the flow of the exhibit from room to room. The most spectacular aspects of the design are evident in the nature section of the show which includes a gigantic glass bell jar housing hanging butterfly pieces in the conservatory. The exhibit is divided into 6 themes: Innovation, both stylistic and technical; Transformations; Nature as Inspiration; Exoticism; Fashion; and Personalities. This not only makes the large number of pieces digestible in an organized way but also helps to explain the historical and design significance of both the jewelry and the firm. 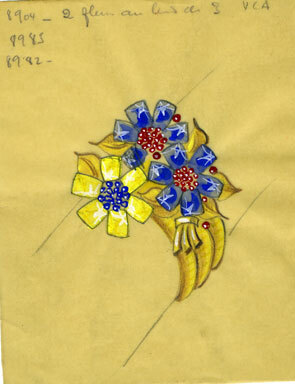 There are also many sketches and drawings in the show that have never been seen before publicly, illustrating both the designs and the commission based approach of Van Cleef, which has always been such an important part of its business. The title, Set in Style is so clever in that it explains Van Cleef’s design importance in a historical perspective but also makes reference to one of the firms signature aspects – the mystery setting, a technique in which the setting does not show between the stones, creating a solid field of color. While many firms were more famous for including major stones in their pieces, Van Cleef made its reputation through the integration of design, technique and artistic interpretation. The coordination of many elements is what sets their pieces apart and the mystery setting is a perfect example. Not only is the overall design of the piece crucial but also the technical skill of the cutter and setter as well as the importance of choosing stones that match exactly in terms of color and clarity. Here is a wonderful video showing the technical aspects of creating the signature Van Cleef mystery setting. 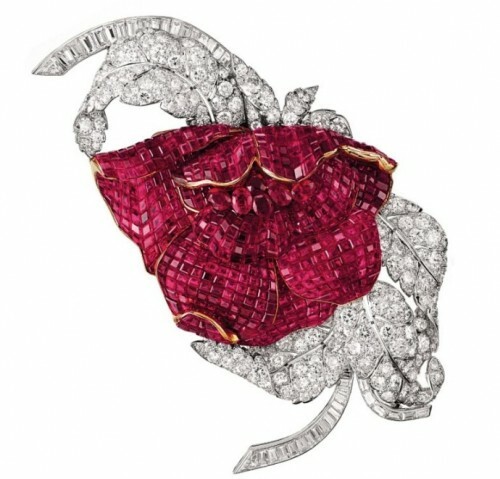 The most spectacular example of the mystery setting is probably the 1937 “Peony” brooch with mystery-set rubies. The brooch, from 1946, was purchased by Mahmoud Fakri Pasha who was the first Egyptian ambassador to Paris. As we first began to tour the exhibit, I was listening to a clearly knowledgeable woman talk about the show to several visitors who accompanied her. I don’t remember how we engaged in conversation, but it turns out she was Caroline Baumann, the associate director of the museum. We spoke briefly about the exhibit, I admired her earrings and she my necklace (because that’s how it goes in the world of the visually obsessed) but it also emphasizes the very accessible and intimate quality of the museum. It was, however, even more fortuitous that we were there at the same time as a private tour being led by none other than Sarah Coffin, Head of the Products Design and Decorative Arts department who organized and curated the exhibit. Her insights were invaluable as we hitched our caboose to the back of that group. At the end, we were able to speak with Coffin who gave us an inside peek into what was involved organizing such an incredible exhibit especially considering the time constraints – a little over a year from start to finish. Hopefully more on that at a later date. There is so much to discuss about this exhibit, that I probably need to devote another day – I did of course want to show you more of the jewels since I know that many of you who don’t live near NYC would be interested and I also want to address the amazing use of technology. So let me end for now with another magnificent piece. 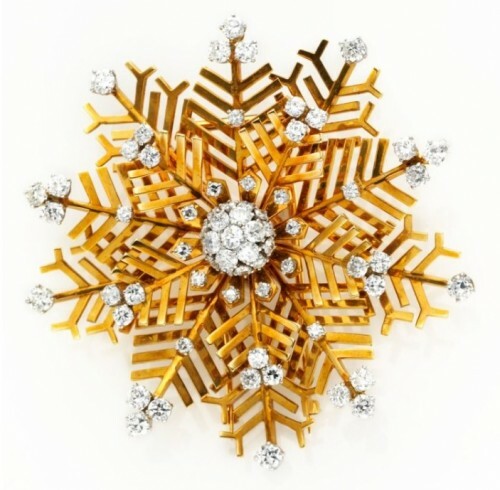 This is one of the earliest known Van Cleef pieces. I just love the delicate interpretation of nature that is still so classic and elegant. This entry posted in jewelry, learning, technology. Entry Tags: Set In Style, Van Cleef & Arpels, Van Cleef Mystery Setting Bookmark the permalink. There is something about the ‘real thing’! Looks a treat all and all! What a pleasure your blog entry was to read this morning. Wow! “Set in Style” is is the best piece I have read in a long time, so informative, so lovely. Just last week my husband and I had lunch at Cafe Sabarsky and viewed the new exhibit at the Neue Galerie. 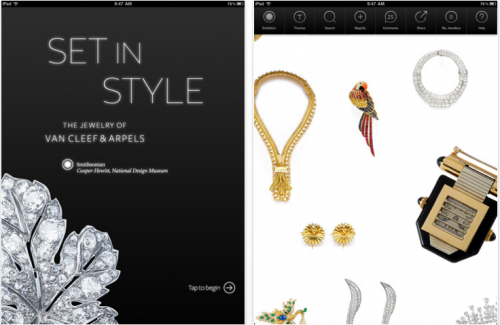 Now I cannot wait to see the jewels at the Cooper-Hewitt. I was a volunteer at The American Folk Art Museum for many years. We had an exhibit in 2004, “Masterpieces of American Jewelry.” There were a few Van Cleef pieces on display. Thank you Judy!! And thanks for stopping by! just realized that my mouth was open in awe and sighing away as i scrolled on. oh how absolutely delicious; your special day, your meet-ups, the back stories and that jewelry! oh, and i was crazy for the display under glass. What a fabulous way to spend a birthday and you were so lucky to speak with the curator to learn more, the exhibit looks amazing I would love to see it, I am eagerly awaiting the next instalment! Oddly enough I just did a post about a French film which is all about a jewellery heist at Van Cleef and Arpels in Cannes. I would have loved this exhibit – what a great collection of classic pieces! Stunning – what a fun day and how lucky to have crossed paths with such interesting and informative guides! Yet another fabulous Q find to add to my NYC visit list. I know you said you no longer celebrate birthdays, but you do live each day full of style and celebrate that which is admirable at any age! Ageless, timeless, and full of style. I must go…..this week! I have fainted. Would it be too much (or too creepy) to say I love you for this. I’m going to go wake my husband now to watch that video. Seriously my favorite post ever. Cannot wait for tomorrow!!! Stacey: I am sending the girls! That last image with the grapes made my hair stand on end. Beautiful writing, as usual with great video. Hopefully, I will make it to the city before it closes. What a wonderful wondeful post! I would love to see this, as Van Cleef vintage is on my list of favourites! gorgeous vine and grapes…what a fun exhibit….and glad it went so well for you and that you met some amazing people…. What an amazing show…and such amazing jewelry too. I don’t know if I’m going to be able to make it up there for the exhibit, so thank you for the post! We are hoping to get to this one, and your review makes it even more vital as a “must” on the agenda. What a lush, luxurious collection, the watercolor is exquisite, it shows a bit of what goes on in creating these beauties. Wow. What a happy day! Beautiful exhibit. I want to hop on a plane and head for NYC. I’m glad you and your sister could celebrate her birthday in such a dazzling way! I LOVE the last piece. I love anything pearls, and wear them with anything and everything. You were fortunate to see this exhibit and speak with the curator. You are a busy lady. You continue to encourage me to get off my “duff” and get out there in this city of Houston. Wonderful blog post. 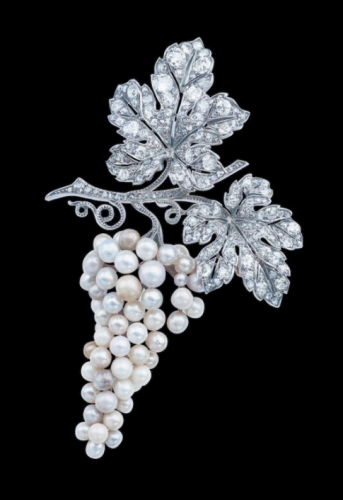 Yes, the pearl brooch at the end certainly made me sigh with wonder. It is so beautiful, soft, and over the top in an understated fashion. Even though I am far from NYC, I can live (blog) vicariously through you. HA! If I said all this to REAL people (non bloggers) they would be so confused. Oh, Q, what a wonderful way to begin my day. This post is completely amazing. I have a wonderful collection of vintage & signed brooches residing in a glass-topped box, nothing like this, of course. But, those pieces displayed in the bell jars (upside down giant fish bowls to me) are stunning. What a visual treat! I’m sure I would hve been there all day. You impress me so much…giving us the best of what’s happening in the city. Thank you!! I really enjoyed this post and your “review” and perspective on the show. Thank you, Q, as always for providing the quintessence of style!! I’m not much of a jewelry person but I saw a few pieces I wouldn’t mind owning. You always have the most informative posts, thank you for taking us along with yuo and I hope you sister had a nice day! Wow! The jewelry is amazingly beautiful! What a treat to be able to try it all on! P.S. I’m going to search for your post on Victoria Hagan now. Thanks for the heads up. I’m sure you did a fabulous review! I love days like that…when the stars align and the bling comes out! This exhibition is on my rather lengthly list of “want to dos” in nyc. What a fun experience to share with your sister. Happy Birthday…to her! What fantastic jewelry! The videos on the Cooper-Hewitt site were great. Thanks for bringing this exhibit to the attention to those of us on the West Coast. Too bad I cannot get to New York for the show. Hi Bob – The accompanying book is gorgeous if you’re interested – I’m sure you can order it online!! Oh my goodness, I think that this is my favorite post of yours that I know of so far! What more could you ask for? Sigh. That last photo just had me gasping but I always love so much your balance of info and glamour–thank you. It’s the real stuff. Was secretly hoping that you would buy the pearls (because how rare is that? And how beautiful?) but love that you gave your sis a great gift instead. I would love to hear the rest about that special day if you can…Again, thank you! Thank you Heather! Was very tempted by the pearls but alas not within budget at the moment! Gorgeous jewelry I especially love that brooch. 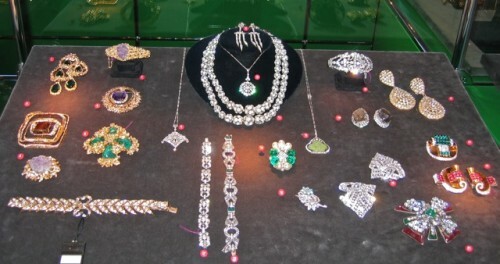 I looove the cooper hewitt… my faveorite of all the NY museums and when you put it together with jewels is even better! One, if not my most favorite jewelry lines/houses. I have a VC&A coffee table book and several smaller tomes as well. Will not make it to this exhibit, so it was great learning about it here! Oh the temptations with all this bijoux! What a great post…and I am sure it was hard to leave them in the case. 88 queries in 1.008 seconds.